MSV: Rebuild by Design - It's Option No. 3! Rebuild by Design - It's Option No. 3! Additional news on selection design for Rebuild by Design in Hoboken via state and city sources. TRENTON –The Christie Administration has marked another milestone in making the state more resilient against storms such as Superstorm Sandy by recommending the construction of a strategically placed flood-resistance system that will protect Hoboken and parts of Weehawken and Jersey City from storm surge. The Department of Environmental Protection’s selection of the recommended option, known as Alternative 3, was announced Thursday evening during a public meeting at Stevens Institute of Technology in Hoboken. “After a very thorough evaluation process that productively engaged local officials and residents, we have determined that this recommended option provides the most cost-effective level of protection from storm surge while preserving waterfront access and views of the river and New York City skyline, goals expressed by the communities,” said David Rosenblatt, DEP’s Assistant Commissioner for Engineering and Construction. 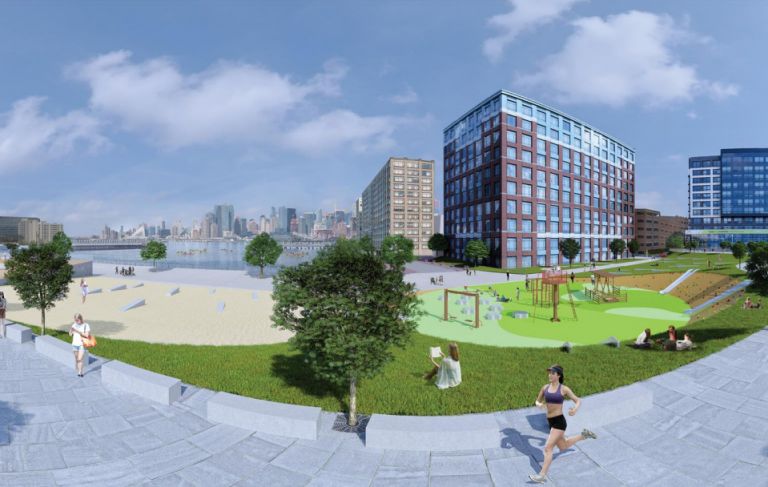 The recommended alternative calls for construction of a flood resistance structure stretching from 19th Street in Weehawken and extending south into Hoboken, slightly inland from the river. An additional flood-resistance structure will be constructed along the southern end of Hoboken. The DEP is reviewing two alignment options for this structure. “Weehawken Township strongly supports the decision to support Alternative 3 as the most feasible alternative presented,” said Weehawken Mayor Richard F. Turner. “I would like to thank the State of New Jersey, New Jersey DEP, HUD and my fellow mayors for giving us the opportunity to participate in this process to protect our cities. The border between Hoboken and Weehawken and the southern end of Hoboken, adjacent to Jersey City are low-lying areas that during Superstorm Sandy acted as funnels for flooding. Storm surge rushed through these two areas and joined forces to cause flooding from the inland side of Hoboken, effectively creating a temporary island on the Hudson River. The flood-resistance structure will provide flood protection for communities and for critical infrastructure, including the North Hudson Sewerage Authority. Alternative 3 will be designed to blend in seamlessly with the urban streetscape and enhance the quality of life in the area. The system will utilize natural higher ground to maximize protection. The DEP expects to formalize the recommendation as part of a Record of Decision that will be filed with the U.S. Department of Housing and Urban Development in the spring. As part of its national Rebuild by Design competition, HUD in 2013 approved $230 million in Community Development Block Grant funding to design and construct a project to protect the Hudson River communities. HUD created the Rebuild by Design competition as a way to promote projects that improve the resilience of urban coastal areas while providing infrastructure that improves quality of life. Formal project design, integrating results of ongoing environmental impact studies that are being conducted by DEP, is expected to begin in spring 2017. Construction is expected to begin in 2019 and take about three years to complete. The DEP has taken a multi-faceted approach to making New Jersey more resilient to severe storms since Superstorm Sandy in October 2012. The DEP is working to ensure all the state’s ocean beaches are built to U.S. Army Corps of Engineers’ protective standards, and has adopted tougher elevation standards for construction and reconstruction of homes in coastal areas. The DEP continues to help at-risk homeowners move out of harm’s way through Blue Acres acquisitions, is financing projects to harden critical drinking water and wastewater infrastructure, and is investigating techniques to restore degraded salt marshes as storm surge buffers. For more information, including a video of a July 28 public meeting during which three final alternatives were discussed, visit: http://www.nj.gov/dep/floodresilience/rbd-hudsonriver.htm.